We’ve seen it in communities across Canada — sports connect us and bring generations together. 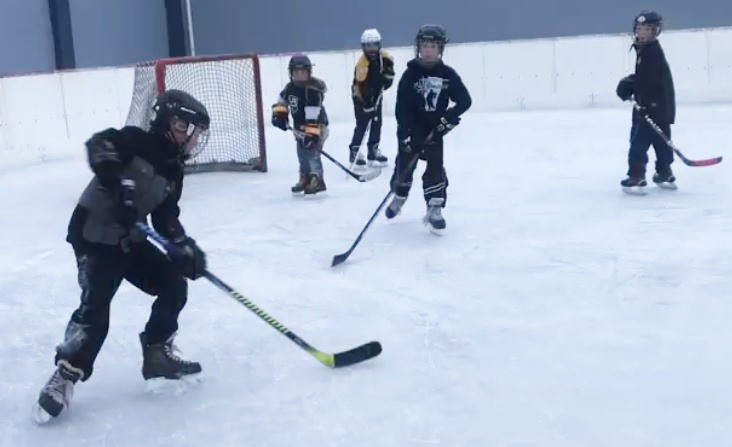 An outdoor sports rink in Hanna, Alberta will see renewed life thanks to sustained community support. In 2018, the Western Communities Foundation (WCF), the charitable arm of Western Financial Group, presented 1 of 20 infrastructure grants — $5,000 each — for new boards at the town’s popular rink. Whether people are practicing figure skating moves, playing pick-up hockey between minor hockey games, participating in a senior players league or playing ball hockey, the rink means everything. “It’s really important as a community to continue to support those efforts, just to make sure the (town) and its (residents) have what they need in order to thrive,” she said. Western Financial Group, along with town partners, also hosted a ball hockey fundraiser for the boards. The rink is key for her team and others — some Western Hanna brokers play there in a hockey league. Gerald Campion, councillor with the Town of Hanna, said the outdoor rink is one of the community’s favourite spots enjoyed by many. It’s not just a winter time event space, he added. Summer brings out pickleball aficionados, Campion said, referring to the fast-rising racquet sport. “It means a lot to us to have the facility utilized on a regular basis,” he said, noting weekends are a particularly busy time for people, and families, to spend time together at the rink. In 2018, over $300,000 in grants and bursaries were awarded through the WCF, which supports public health, public housing, education and recreation projects in communities where Western operates. Funds from the annual Support the Cause walk, Fall Classic Golf Tournament and other events are given back via student bursaries, grant funding and infrastructure improvements.